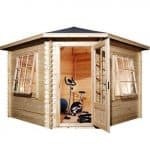 The Waltons Zen log cabin range comes in numerous variations. The Zen 1 is a simplistic, yet impressive building that offers an unusual design. 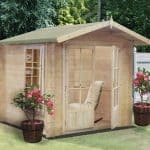 Featuring both a shaded outdoor area and a small, enclosed space, it is ideal for use as a home office or an extended family seating area. The cabin benefits from an extremely impressive 28mm tongue and groove construction. This guarantees a solid, secure and weatherproof design. It doesn’t just stop there either. You can also choose to customise the cladding, upgrading to either 34mm or 44mm thick logs. In fact, it is the customisation options which make the cabin so impressive. There are numerous ways you can maximise its potential. Two of the main things Waltons have focused on with this cabin is security and stability. For great security, the manufacturer has added a chrome plated door handle complete with lock and key. Single glazing comes as standard, though you can also upgrade to double glazing for extra security and insulation. 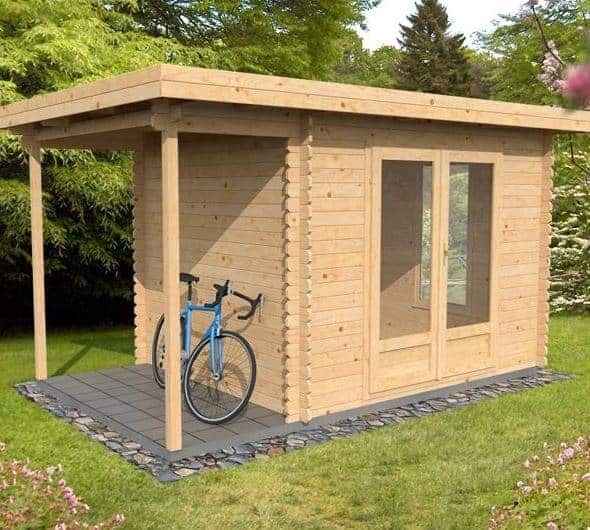 All in all this is a very stylish and practical building that would make a great addition to any garden. 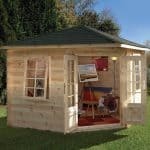 It is one of the more compact log cabins available and its range of great features gives it excellent value for money. High cost, especially if you take advantage of the customisation options. However, this cost is definitely worthwhile when you take into account the features and benefits you are receiving. 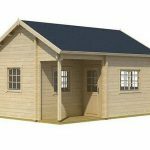 This is a practical and stylish log cabin that can be used for a number of purposes. Mainly it is designed as an additional living area, providing a great place to relax and unwind. 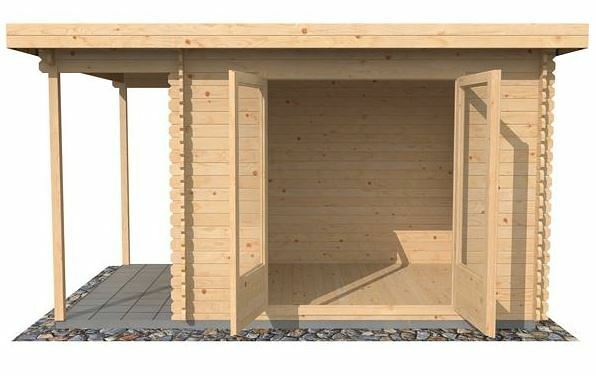 There are 3 different Zen cabins available and this Zen 1 addition comes with a stylish veranda at the front of the building. This sheltered area can be used in all weathers and is perfect for outdoor entertaining. Considering this cabin comes with a flat roof, it benefits from an incredible height. Even the doors come with pretty tall measurements, so no matter how tall you are you shouldn’t have to duck to enter the building. We also like the wide design of the doors. 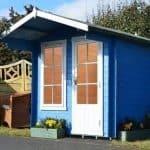 Standard shed doors tend to measure around 0.75m. So at 1.52m, you can see just how much additional width these have. 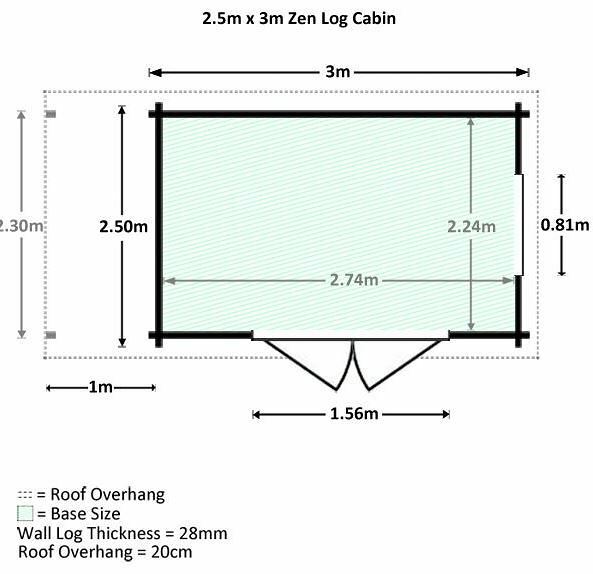 The Zen 1 cabin features a unique flat roof. Typically you’ll find most cabins have either a pent or an apex roof. So the fact that this one is flat does provide the building with a more unique and striking look. The only issue that could arise from the flat design is water could collect and cause problems with rot over time. However, Waltons have thought of this and added a slight gradient which acts as a fantastic water resistant feature. They have also covered the roof with sand felt to add further weatherproof benefits. The roof is one of the things you can customise too, opting for the more superior felt, or from the technologically advanced shingles. Both of which are discussed under the customisation and extras section. Both the roof and the floor benefit from super thick 19mm tongue and groove construction. In regards to the roof, it ensures even the strongest winds won’t cause damage. It also offers great stability in case any falling debris such as large tree branches, fall onto the roof. As for the floor, it means you can add anything from heavy furniture to gym equipment without worrying about causing damage. It also provides a very sturdy feel underfoot, giving you great peace of mind. This is one of the log cabins offered by Waltons which you can customise the thickness of the cladding. The cost of the building includes 28mm cladding. However, you can also upgrade to either 34mm or 44mm thick timber. The 34mm thick cladding offers more insulation and rigidity than the 28mm version, but the most benefits come from the thickest, 44mm cladding. It comes with a double wind channel which really helps to eliminate drafts, as well as providing exceptional insulation. Obviously the thicker the cladding, the more expensive the building will be. However, it is definitely worth spending as much money as you can afford to make the building as strong, durable and comfortable as you can. When you look closely at the building, you can see it has a very tight, interlocking design. Tongue and groove cladding not only gives the cabin a very secure and solid build, but it also makes it easy to erect. The panels slot simply together, reducing the time it takes to assemble. What’s great about this cabin is that Waltons have also made sure to make the frame just as solid as the rest of the building. Firstly there’s the roof joists used to support the 19mm tongue and groove materials. These joists measure an impressive 44mm thick. The interior frame boasts a very thick, rounded and smooth design which we feel is a major advantage in terms of overall stability. Whilst technically, the thicker the cladding the more durability it provides, the cabin still needs to be treated. It doesn’t matter how thick the walls are, it’s extremely important to treat at least the surface of the timber to ensure it withstands the elements. The first treatment needs to be applied directly after it has been assembled. Then if using a water treatment it should be reapplied every year, whilst spirit treatments can be applied less frequently depending upon their quality. Spirit treatments may come at a higher cost, but they also provide a deeper water resistant barrier. In fact, they leave a barrier on the surface, as well as deep inside the wood. This provides maximum protection, ensuring even the heaviest downpours don’t cause damage to the timber. Following this treatment advice will entitle you to the 10 year anti rot guarantee supplied with the cabin. Double doors offer easy entry into the cabin and they come with a stylish glazed design. The glazing is the same as the window on the building and both can be upgraded from single to double glazing. The single glazing measures a standard 4mm thick. However, the double glazing measures an outstanding 16mm thick. Not only does this supply a fantastic amount of additional insulation, but it also makes them more difficult to break. We’d recommend upgrading to the double glazing option if you can afford it as it will help to make the cabin more comfortable in colder months. There is just one window supplied and it can be opened from the bottom. The push-out style gives it a more modern design. So not only can you insulate the building to make it more comfortable in winter, but you can also ventilate it making it more comfortable in the warmer months too. This cabin is pretty secure thanks to the lock and key added to the double doors. The built in mortise lock is hard to break into. The actual cladding itself isn’t going to be easy for even determined thieves to get through either; even if you stick with the standard 28mm cladding. So in terms of security it is one of the most secure cabins on the market. Privacy wise it is fairly limited due to the glazed double doors and window. However, this is easy to remedy as you can add curtains or blinds. 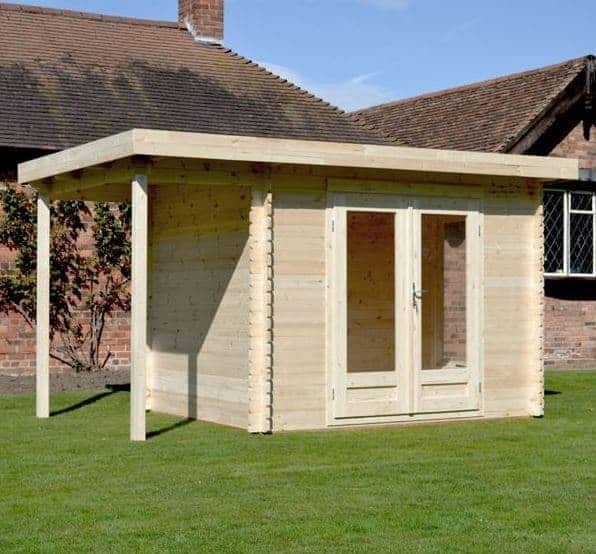 The customisation options available with this log cabin allow you to really improve its overall strength, security and durability. They can also make the cabin more comfortable; particularly throughout winter. It is worth noting however, that most of these customisation options will push the cost of the cabin up significantly. What you need to factor in before you decide whether or not to upgrade, is the long term benefits the customisations will provide. The two most important customisation options include the glazing and the thickness of the cladding. 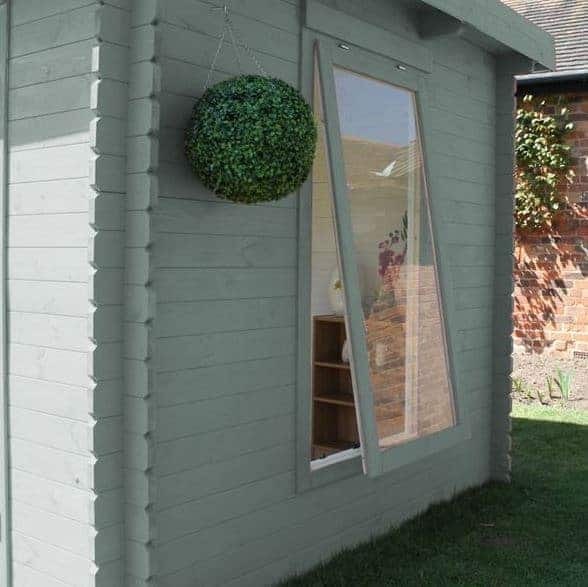 Single glazing and 28mm cladding come free as standard with the cabin. Waltons give you the opportunity to simply alter the glazing, the thickness, or both. For example, you can stick with the 28mm cladding, but upgrade to double glazing. Or you can stick with single glazing and opt for thicker cladding. So what’s the difference between the cladding and glazing options? The single glazing measures 4mm thick and is provided on both the window and the doors. The double glazing you can upgrade to is significantly thicker, measuring 16mm. So what does this extra thickness provide? Well, mainly it helps to insulate the building, helping to make it warmer in the colder weather. However, it also adds a good level of noise reduction, as well as making them more difficult to break. So by upgrading you won’t just be making the cabin more comfortable to use all year round, you’ll also be adding to its security. The cladding upgrade is also worth considering. Whilst 28mm is very impressive, you are also given the chance to upgrade to either 34mm or 44mm thick logs. Again, the main benefit of investing in thicker cladding is the insulation it provides. Compared to the 28mm standard cladding, the 34mm for example, adds a lot more insulation, helping to keep it warmer. However, the main benefits come from the thickest, 44mm premium cladding, where Waltons include a double wind channel in the building’s construction. This adds ultimate insulation and creates an incredibly draft proof construction. So depending upon how often you plan on using the cabin and what you are using it for, it could definitely be worth investing in the thickest cladding and glazing available. Along with the walls and glazing, you can also upgrade the roof. This is something we highly recommend as unlike a lot of other buildings, this one doesn’t come with a roof cover. So you have two upgrade options here. The first is Superior duty roofing felt. This is made from great quality, thick fibreglass and it offers a fantastic amount of water-resistance. It comes with a self-adhesive backing so installing it is really easy. It’s also really affordable and you can choose from olive green or charcoal colours. The second choice is the Walton’s ArmourShield Shingles in charcoal. Shingles are a kind of roof tile which are commonly used not just for their exceptional water-resistance, but because they offer a much more decorative finish. These ones have a textured design which help to make the roof really stand out. Usually we do recommend Shingles, largely because of their decorative appeal. However, with this cabin the decorative benefits would be wasted due to the flat roof. You won’t be able to see the shingles really, so you’d only be receiving the water-resistance benefits. Now obviously the water-resistance benefits are fantastic. However, we don’t feel they offer much more protection than the Superior Duty felt so considering the difference in cost, in this instance we recommend the felt over the Shingles. 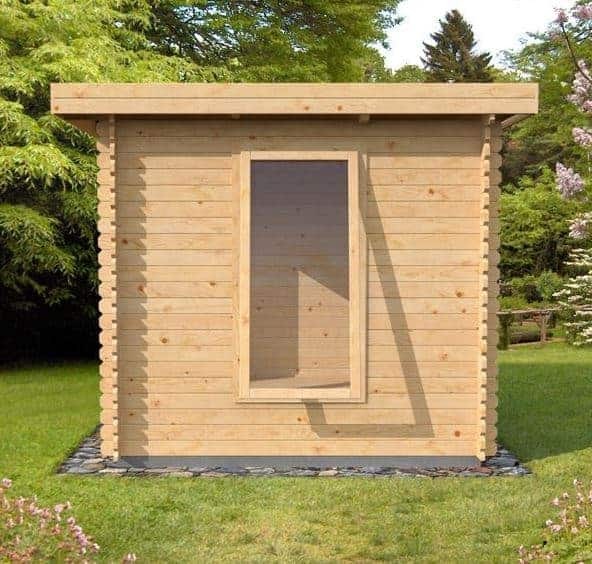 A couple of extras are on offer with this cabin and whilst they are both fairly expensive, they are worth considering. The Eco-Quilt building insulation kits help to keep the cabin warm during winter. These are a particularly good investment if you aren’t planning on upgrading the cladding or the glazing. You have two different packs to choose from, with one offering 30 square metres and the other offering 60 square metres. Both comprise of six thermal wadding layers, a reflective foil layer and breather foam. They are one of the most effective outdoor building insulation kits available and they come with everything you need to install them. Adding insulation to the cabin doesn’t just make it more comfortable, it also helps to keep electrical costs down if you decide to install an electrical pack for lighting and power. If you do want to add electricity to the cabin, but you want to avoid long term running costs, the solar panel extras are just what you need. Granted, these do come at an incredibly high cost. However, they use renewable energy and won’t cost anything to run once they have been installed. You have a choice of five different solar panel kits. Each runs at a different voltage and offers a varying level of power. Before choosing one you will need to consider what you are planning on powering and how many things you want to power at the same time. You also have a choice between free-standing and roof-mounted panels. The free standing varieties are more flexible and can be mounted anywhere. It is for this reason they are slightly more expensive than the roof mounted panels. Just looking at the Zen 1 cabin, you can see it has an outstanding quality design. It comes with thick cladding and the option to upgrade to eve thicker walls. However, even if you make no alterations to the building, it still offers incredible quality. Made from solid log timber, the building is designed with longevity in mind. Obviously, the more upgrades you add to the cabin, the longer it will last. However, even with the standard features supplied it is still going to last at least 10 years; something that is highlighted by the 10 year anti rot warranty. The storage space supplied is actually split into two parts. Mainly you have the interior section where you can comfortably fit a range of large equipment and furniture. You then have the small outdoor shaded area where you can store bicycles, wheelie bins and compost bins. 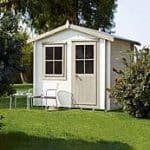 Log cabins aren’t as simple to erect as storage sheds, but thanks to its slightly more compact size, the Zen 1 is one of the easiest to assemble. You should find it all goes together perfectly. However, expect the panels to be pretty heavy due to the cladding’s thickness. Make no mistake about it, this cabin will last for many years. It also doesn’t require annual treatments. So these two things alone help to give the building good value for money. If you factor in its other great features, along with the fact you don’t necessarily need to spend any additional money on upgrades and you realise you have a building which offers superb value for money. 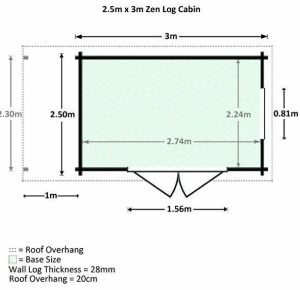 Final Thoughts: If you’re looking for a simplistic, yet stylish log cabin, the Zen 1 is an ideal choice. Compared to other log cabins, this one does come with a slightly more compact design, making it a good choice for even smaller gardens. It provides a secure and sturdy indoor area which can be used in a variety of ways. We also like the sheltered area which gives you the opportunity to sit out on hot sunny days without getting burnt. Just some of its impressive features include a secure lock and key door, a range of fantastic customisation options and corner joints chalet connections.